We are Manufacturer, Supplier and Exporter of Coat-Resist Point Level Switches. This product is also known as Coat Resist Point Level Switch, Point Level Switches. Our setup is situated in Pune, Maharshtra, India. 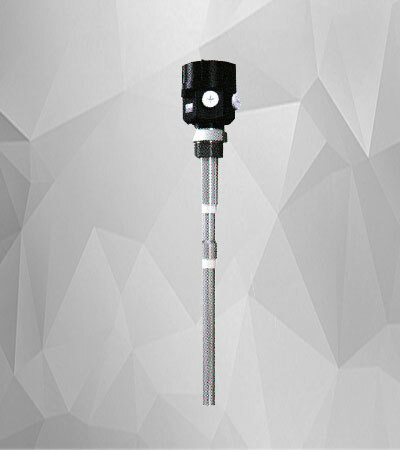 COAT-RESIST is a compact point level switch with integral electronics, based on RF Admittance measurement technology utilizing a three electrode design with active shield compensation. 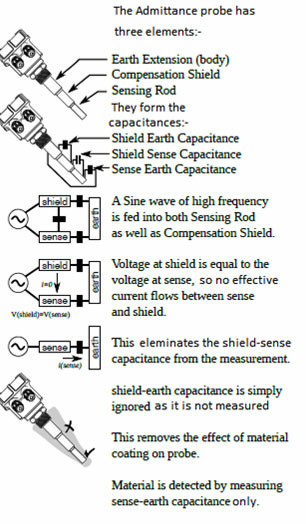 It is superior in performance to conventional capacitance based systems that often suffer from false level detection due to service material adhering to the probe electrode. It offers a satisfactory solution in tough environments where service material has a tendency to coat, where there is bridging (build up) of material between the probe electrode and side wall of the vessel, where, material particles having electrostatic charge float in the vicinity of the sense electrode, and the vessel internal temperature is high. Such environments are often encountered in electrostatic precipitators wherein no other instruments are suited. The instrument has a built in discharge device to protect it from damaging effects of static electricity. 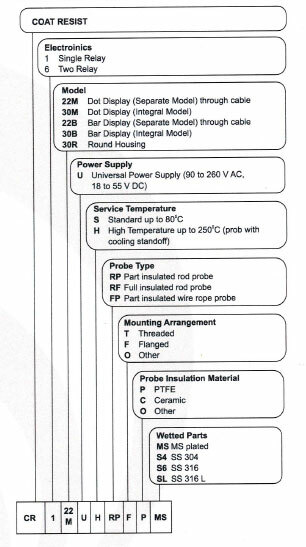 The probe comprises of three elements; Sense, Shield and Ground electrically insulated from each other by means of suitable insulators. The Sense element and the vessel wall (Ground) serve as the two electrodes of an electrical capacitor with the service material as the dielectric. A change in material level causes a change in the Admittance which is measured by the electronics. A Radio frequency oscillator generates the measuring frequency. An impedance transforming shield isolation amlifier is used to drive the shield actively to maintain the equipotentiality between the probe and shield electrodes thereby immunizing the probe from build up and coating. For clarity please refer to the figure on the left. Level limit detection of fine, coarse, solids of low dielectric constant that have a tendency to stick coat and develop static charge at high vessel temperatures and in bulk material handling. Can be used for level detection of powders, sand, sugar, pulverized coal, food grains, cement, stones, gravel, flyash, bed-ash, clinker etc. Coat-Resist finds use in cement plants, power plants, ash handling systems, soap and detergent plants, paints and emulsion plants etc. Established in the year 1990, we Sneha Bearings Private Limited, an ISO 9001:2008 certified company is engaged into design, manufacturing and exporting Structural Bearings, Material Handling Equipments & Disc Spring Hanger Assemblies. We are also Manufacturer, Exporter & Supplier of Level Sensors, Level Detectors, Level Indicators, Point Level Switches, Level Limit Switches, Solid Level Switches, Solid Level Controllers, RF Level Switches, Admittance Level Switches, Capacitance Level Switches, Vibrating Level Switches, Silo Level Switches, ESP Level Switches, Ash Level Detectors, Speed Monitors, Under Speed Switches, etc.